We are advocates of positive dog training techniques. Teaching your dog using force-free, scientific and positive methods has been shown to be much more effective and kinder than harsh and aversive techniques and it also helps to create a stronger, happier and more trusting relationship between you and your dog. Food rewards can be great motivators for your dog. Making sure that you reward at the right moment (using a clicker can help with this), with the right frequency, and using super tasty and varied treats is important in ensuring that you have a successful training session. Often, if you are fumbling around trying to get treats out of your pocket, you can miss the opportunity to reward at the right moment and it also means that your pockets can get smelly, greasy and clogged with the squashed remnants of whatever you were using during your last session. Yuck, it is not pleasant. Investing in a good training treat pouch will mean that you have nice easy access for quick-fire rewarding, you will no longer have smelly, greasy hands when you put them in your pockets and you can often use them to keep other handy items stored, like keys, a ball, your mobile phone and poop bags. There are LOTS of training treat pouches on the market and some are better than others. There is nothing worse than doing one training session and finding that the lining for the pouch is coming away, the bag won’t stay closed when not in use and treats fall out all the time, or that it is too cumbersome or you can’t get the treats out easily. Everyone has their own personal preferences and some are more useful in certain scenarios than others but knowing which ones are well reviewed and popular can give you a good starting point for selecting the one you want to give a whirl. Having a good treat pouch can help with ease of quick reward and saves you getting greasy, smelly pockets. Below is a list of recommended training treat pouches, along with details of their pros and cons. 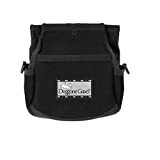 The Doggone Good Rapid Reward Training Treat Pouch is a favourite of mine and it is a popular and well-reviewed product in general. This is the go-to bag for a lot of dog training enthusiasts and dog sports competitors. It is a very durable bag that stands up well to regular use. It has a good inner lining that stops the bag from getting funky, it is a really generous size and will fit plenty of treats (and even a ball too) and, even when full up, it still closes properly The opening for the main compartment is magnetic so it makes it easy to flip open and closed. There is also a divider inside the bag and this means that you can have a couple of different types of treats kept separate should you want to mix things up or keep the super duper tasty treats for jackpots or more challenging tasks. There are some extra handy compartments so that you can fit poop bags, a clicker and a mobile phone (although it can be a snug fit in the zip compartment) and keys if you want to. It gets great reviews in terms of ease of quick access to the treats (crucial when you are doing quick fire clicker training). It can be attached by a waist strap or it can hook over a belt. It also comes a variety of great colour choices. Summary: Many dog professionals choice, fits lots of treats, easy to access them, has lots of secure extra pockets, very durable and lots of colour choices. It is not the cheapest option though and it does bounce about if you are being active. The PetSafe Treat Pouch Sport is another go-to pouch. It is at a cheaper price point than the Doggone Good one and it has a different shape. It is a flatter, rectangular shape rather than a traditional oval pouch style. This means it does sit a little better against the body and may not bounce about so much if you are running but it also means that the treats can get stuck in the corners and can be a bit more tricky to get out, especially when you get down to the last ones. This is even more of a problem if the rewards you are using are semi-moist. The Doggone Good pouch perhaps allows for slightly easier quick access for the treats but because the Petsafe one has a spring loaded opening it does stay open very well. It has a large outer pouch that can fit some of the necessities like a phone and keys. It also has a couple of outer clips which you can attach a clicker or poop bags to. It comes in three colour choices too. The one thing I am not a fan of is that this product is from a brand that also sells aversive shock collars and, personally, I am not keen on supporting a business that sells a product that I do not approve of. This is just a personal preference though. Summary: Another popular choice, very easy snap open and shut function, a good price point and hard wearing. Treats can get stuck in the corners and whether you purchase will depend on your views on companies that produce shock collars. If you want to be trendy and fashionable with your treat bag choice then you can’t go wrong with the Ruffwear Treat Trader. Honesty, it is probably not quite as multi-functional a choice as the Doggone Good or Petsafe version but it is still extremely well made, made from very robust material, very usable and it looks the business! It has a good magnetic closure, and it has a small front pocket to fit a few poop bags and a clicker. 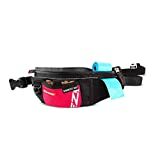 It also has a waist strap or belt clip and the water-resistant lining will help to contain any greasy leaks from the treats. It also sits really flush against your body so it is wont bump around too much if you are doing a more active training session. It doesn’t have room for phones and bigger items though. It is one of the most expensive treat bag options (it is Ruffwear after all) but you know you are getting something that is extremely well made and built to last. It is the sort of pouch you would hope would last for years to come. It only comes in one colour, grey, so if you love something bright and colourful then you may be better for opting for one of the Doggone Good designs instead. Summary: Looks very stylish, extremely robust and ergonomically designed. It doesn’t have many extra storage compartments though and it is expensive. If you are looking for a compact treat pouch and you don’t want to spend a lot then the Chuckit Treat Tote could be the choice for you. This is a very simple pouch, it doesn’t have the bells and whistles of some of the pouches above but it is such good value for money, so if you are just using it occasionally or want to try a pouch out to see how you like working with one then this could be a good purchase. 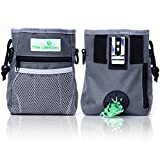 It is big enough to fit a full cup of treats, has a drawstring opening, has a water-resistant inner and it has a belt loop and a belt clip too. It also comes in a slightly larger size too if you want to fit more treats. The treat bag comes in three different colour choices (blue, black and red) but most suppliers do not give you an option of which one you will receive – it is just the luck of the draw. Summary: Great value for money and perfect if you are on a budget. It is simple and well made. It doesn’t have any extra storage pocket, the drawstring function means you can’t access the treats so quickly when you need to open it and it doesn’t have a waist strap. The Paw Lifestyle Training Treat Pouch has a lot of the expected features. 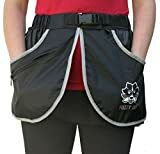 It has a drawstring opening, a large treat compartment, a built in poop bag dispenser sections, it has a couple of zippered storage areas, and it can be worn around the waist or clipped to a belt. It is also well priced too. The additional different feature on this that makes it a bit more unique is that it comes with a shoulder strap, so if you prefer to wear it as a bag then you have this option too. Summary: Good value for money and a great over the shoulder option if you are not keen on wearing it around your waist. Some people use pieces of their dog’s food, sometimes even when it is raw food, or they use extremely soft and squishy treats. They can be very messy, often very smelly and squish into the fabric of the bag and it can be difficult to clean and dry the pouch afterwards, sometimes the smell can linger too. 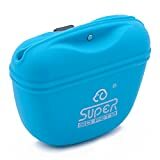 The Super Design Silicone Treat Pouch doesn’t have as many functions as most of the other pouches on the list but if you really want something that is super hygienic and easy to clean then this may be the one to opt for. It can even be put into the dishwasher to clean it. It can only attach via the clip to a belt loop, it doesn’t have a waist strap. Some people also feel that the magnetic closing function is not strong enough and that it can be difficult to get your hand in to access the treats easily. Summary: It is probably not the most functional treat pouch but if you use a lot of sloppy, smelly treats that this one is super easy to clean. If you do a lot of training or rewarding for desired behaviours when you are on a longer walk, it can be useful to have something that will carry more than just your dog treats. Instead of having to have a normal bag and a treat pouch, getting a practical dog walking bag can be a good choice. 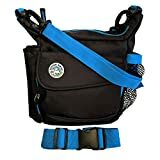 The Jasper Swag Dog Walking Bag is a more expensive investment but it is so multi-functional that you will hopefully get tons of practical use out of it. The front pouch has a magnetic and zipper closure and this is a great place to store the treats for easy access. It has a side pouch designed to fit a water bottle which is great for a longer, warm day walk. The other mesh side pocket is perfect for storing a slobbery ball, or a second bottle of water for an even longer hike with your dog. There is a poop bag dispenser section at the rear of the bag and it can be worn over the shoulder or around the waist with a belt strap. It is also made from a weatherproof material so that your treats and phone won’t be at risk of getting soggy if you get caught in the rain. The big main compartment is large enough to fit a purse, hand sanitizer, keys and any other daily essentials. Summary: Super versatile, lots of options, perfect for longer walks and to save having a separate treat pouch and bag. It is bigger and bulkier though so not ideal for use purely as a treat pouch. It is also a bigger investment so you want to be sure you would actually use it. If you are looking for an option for administering treats on the move then the Ezydog SnakPak could be the treat pouch for you. A lot of treat pouches bounce about annoyingly at your waist when you get active. This can be distracting and uncomfortable, especially if you are working on things like agility or running with your dog in canicross. The EzyDog SnakPak sits comfortably around the waist, it has a smaller magnetic opening pouch at the front for treats and then a larger zippable section at the back that is great for your phone, keys and other essentials. It also has a little side pocket that is perfect for storing some poop bags. Ezydog products are known for being well designed and very robust. The fact that it fits so snugly around your waist means that it does not have the annoying bounce that many other treat pouch options do. The treat pocket is not as big as what you would get with a normal pouch though so, if you plan to be giving out a lot of food rewards, you may need to store some extra ones in a bag inside the back storage area to top up when required. Summary: Really well made, lots of storage options, doesn’t bounce about when running like a lot of other pouches do. It doesn’t have as much room for treats as some other pouches though and it is more expensive than a standard treat bag too. If you often use a toy as well as treats for rewarding your dog during training, unless it is a small item like a ball, it won’t usually fit in a treat pouch. It is also annoying when the ball gets in the way of accessing the treats. The Fuzz Jay Agility Skirt is a great alternative to a treat pouch. It still fastens around the waist but it has three large pockets rather than a pouch. It has two side pockets and then a large pocket at the rear and this is big enough to even fit a frisbee in it. It is made from water-resistant material which is perfect if you are being dedicated and training outdoors in bad weather and it means the pockets do not absorb any grease from the treats. The pockets are deep and it saves you from having to faff around with the openings of a treat pouch. The design means that you will not be impeded if you need to bend, crouch or sit down. It also has a loop which can be used to attach a clicker for ease of access. It can even fit a water bottle or folding bowl if you decide to use it when you go for a longer walk or hike. Summary: Not the cheapest option and not the most stylish if you plan to use it out on walks or hikes but it is very practical and can fit more toys and other things than a normal treat pouch and it saves you having an overhanging pouch too. 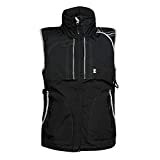 So the Hurtta Training Vest is expensive and probably regarded as a luxury but if you are training regularly you may feel like this is worth investing in. If you are doing a lot of outdoor training and want a lightweight option to take the chill off that also teams up as a great tool for storing treat and toy rewards then this is a really practical option. It is water repellant, breathable and it also has a packable hood if you are caught short with a rain shower. There are five zippable pockets and the front ones are particularly deep and one of them also has a removable inner that can be washed out separately. This is really handy if you have been using particularly smelly, greasy or smooshy treats. There is a very large pocket on the back of the vest and this is ideal for storing training dummies or frisbees. There are a number of rings and clips around the vest and these are useful for attaching things like clickers. Some people have complained that the removable inner is in the left-hand pocket and it would make more sense for it to be in the other pocket for ease of access for right-handed people. Summary: If you don’t mind shelling out the price for this luxury item it works well for the serious training and dog sports enthusiasts. With lots of deep zippable pockets and enough room to store plenty of training toys as well as treats. Once you have a great training treat pouch don’t forget to take the time to pick the right kind of motivational treat for rewards. If your dog is super food motivated, is not learning a challenging new behaviour, is not working in a new, more distracting environment, or they are overweight and you have them on a diet, then it might be enough to use some of their daily food portion as rewards. For learning new behaviours or for dogs that are not so motivated by plain kibble or standard dog treats, you may have to up the ante and find something super high value. Pieces of cooked chicken, small cubes of cheese or semi-moist dog treats with a high meat content often work well. Make sure you pick something with good quality ingredients and that can be broken down into very small pieces for frequent rapid treat administration. Keep mixing it up too, your dog can get bored of always having the same thing and variety will keep them more interested and motivated. Save their favourites for new and distracting environments, mastering a new skill or for behaviours that are proving particularly challenging for them. See our article for more details on selecting good training treats.